The launch of the publication saw the presence of Principal Secretary for Tourism Mrs. Anne Lafortune and Ms. Philomena Hollanda, Director for Risk Management at the Ministry for Tourism. During his address to the press, Minister Dogley commended the efforts of the Tourism department for the initiative. 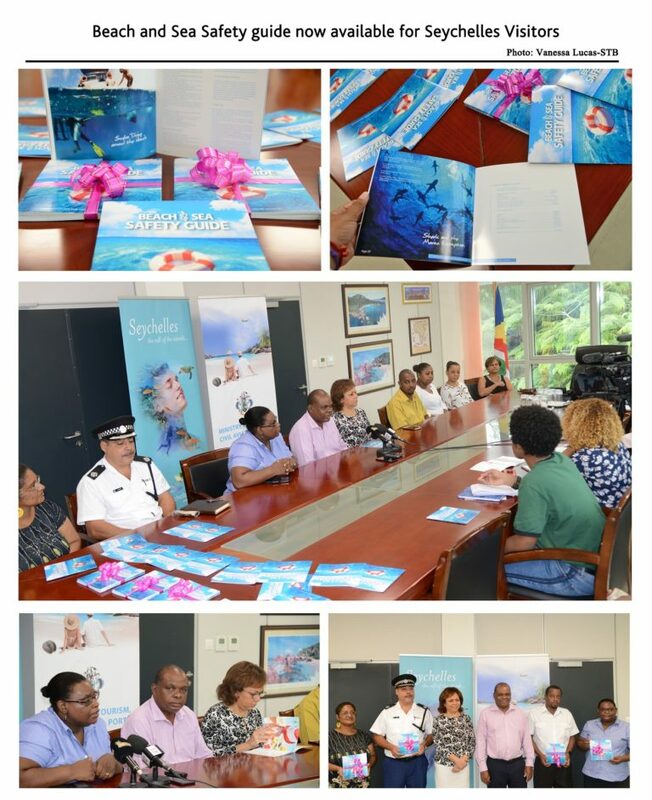 He also extended his compliments to the Seychelles Police, Seychelles Lifeguard, Seychelles Maritime and Safety Administration and the Seychelles Tourism Board who have contributed towards the publication the for their assistance. “As a destination it is our obligation to provide our visitors with correct and concise information, more often than not our guests feel like they are in paradise and there are no risks. They forget that anywhere they go around the world they need to take precautionary measures to keep themselves safe,” said Minister Dogley. The Beach and Sea Safety guide is an updated version of a similar publication released in 2014 by the department. The booklet, which will be shared with all tourism establishments and visitors through the STB Visitors Office on Mahé, Praslin and La Digue, seeks to educate the visitors on safety measures that they should undertake whilst on their holiday. Taking about the guide, Ms. Philomena Hollanda mentioned that the content has been updated in view of the developments that have occurred in the past 5 years in Seychelles. She also pointed out the new features of the booklet including indications of warning signs, additional information on marine fauna. “In view of the sudden increase of visitor’s arrivals there is a pressing need for our department to find a way to inform our visitors about safety for their own good. The booklet is a user-friendly publication, which has been designed with beautiful pictures of the Seychelles. It provides information and can also be kept as a souvenir,” Said Ms. Hollanda. Some 10,000 copies of the booklet has been printed and a digital copy of the same is available on the department’s website. 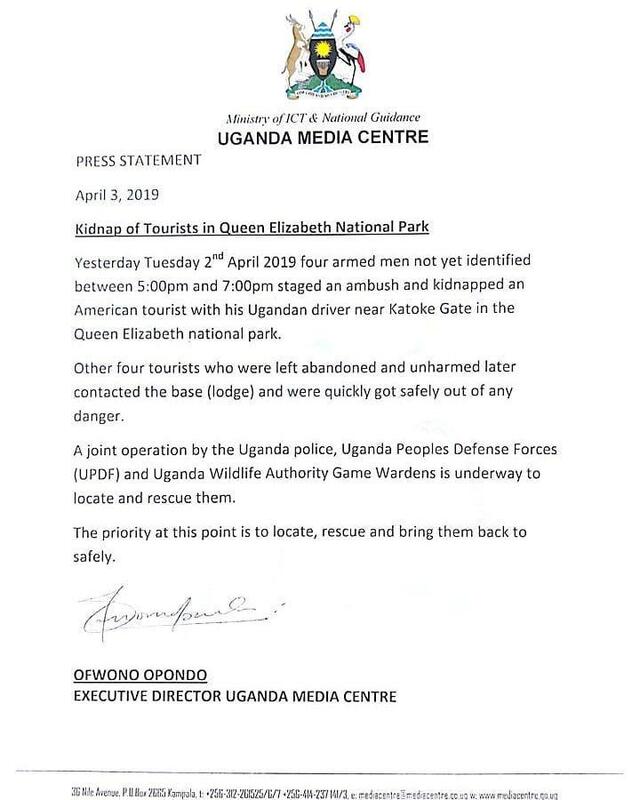 Not only leopards were roaming Queen Elizabeth National Park today, but criminals who kidnapped an elderly American tourist in the park today, and put the well-organized travel and tourism industry in Uganda on edge. Yesterday, Tuesday 2nd April 2019 four armed men not yet identified between 5,00pm and 7,00pm staged an ambush and kidnapped an American Tourist with his Ugandan driver near Katoke gate in the Queen Elizabeth National Park. Four other four tourists who were left abandoned and unharmed later contacted the base (lodge) and were quickly moved to safety. A joint operation by the Uganda Police, Uganda Peoples Defense Forces (UPDF) and Uganda Wildlife Authority Game Wardens is underway to locate and rescue them. The priority at this point is to locate, rescue and bring them back safely. eTN talked to Lilly Ajariva. She is a Ugandan conservationist and tourism expert. 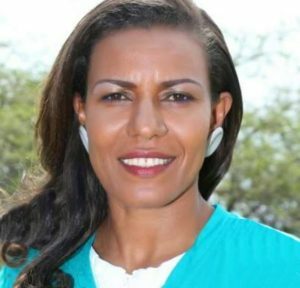 She is the Chief Executive Officer of the Uganda Tourism Board, the Ugandan government agency that is charged with promoting the country as a tourism destination. She was appointed to that position on 10 January 2019. When asked why an American Tourist was picked by the kidnappers, Ms. Ajarova thinks the selection was based on the age and not the nationality. 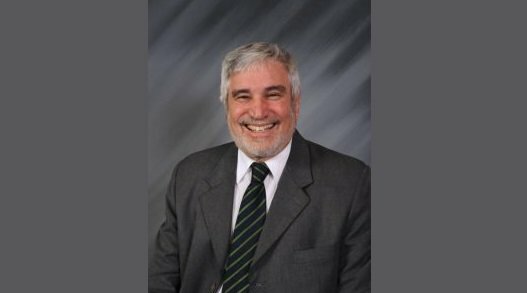 Dr. Peter Tarlow is also the security and safety expert for the newly-founded African Tourism Board and will be speaking at their launch event in Cape Town next week. 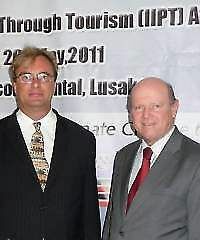 Peter is scheduled to meet with UTB CEO Lilly Ajarova to discuss any assistance the Africa Tourism Board can give in this situation. Dr. Tarlow told eTurboNews: “The tragic kidnapping that recently occurred in Uganda should not be seen as indicative of overall safety in Uganda. “Very much to the contrary, Uganda has been known over the decades to be a safe and secure destination. Unfortunately, there are bad people in every part of the world and travel implies risk. “However, Uganda cannot afford to rely on its recent past but must show the world what it is doing in the future. “Despite the fact that the situation is very fluid and the facts, at midnight Uganda time is still unclear, there are a number of things that Uganda can do immediately and in the short and long term to mitigate the damage to its reputation. With limited data, the African Tourism Board security expert suggests the following, and as more data becomes apparent, additional information will be provided. 1) Tell the truth. Under no circumstance, minimize, become defensive or refuse to accept the severity of the situation. Do not lie to reporters. 2) Have one person be the tourism spokesman or woman and funnel all information through that person. 3) If the information is not yet known, state that facts and then state that there will be regularly-scheduled updates. Give specific times and locations. 4) Have the military of a police officer standing next to the spokesperson to indicate that this is a serious matter. 5) Make sure that it is clear that the government is working with all foreign embassies and updating them on a regular basis. 6) Indicate that Uganda is working with the visitors’ families and will do everything that is needed to help the family. 7) Announce that there is a special unit at work (assuming this unit exists) that deals with hostage rescue and recovery. If it does not exist, then contact friendly foreign governments that have experience in this matter. 1) Announces that the country is doing an update on its risk management. 2) Gets articles in the media that speak about Ugandan positives. 3) Indicates that the perpetrators will be found and that they will suffer the full consequences of the law. 4) Opens a foreign visitor hotline so that all visitors can get up-to-date information. 5) Announces that the Ugandan tourism police will be opening (or strengthening) their tourism police unit and that they will receive additional training. 6) Make it clear that Uganda tourism is working with international boards such as the African Tourism Board (ATB) and that there will be exchanges of information between the African tourism bureaus through the ATB. In aviation operations, managing fatigue is important because it diminishes an individual’s ability to perform almost all operational tasks. This clearly has implications for operational efficiency, but in situations where individuals are undertaking safety-critical activities, fatigue-effected performance can also have consequences for safety outcomes. Fatigue is a natural consequence of human physiology. Because fatigue is affected by all waking activities (not only work demands), fatigue management has to be a shared responsibility between the State, service providers and individuals. For most workers, hours of work are part of the working conditions and remuneration packages established through industrial agreements or social legislation. They are not necessarily established from a safety perspective. However, the need to limit pilots’ flight and duty hours for the purpose of flight safety was recognized in ICAO Standards and Recommended Practices (SARPs) in the first edition of Annex 6 published in 1949. At that time, ICAO SARPs required the operator to be responsible for establishing flight time limits that ensured that “fatigue, either occurring in a flight or successive flights or accumulating over a period of time, did not endanger the safety of a flight”. These limits had to be approved by the State. By 1995, ICAO SARPs required States to establish flight time, flight duty periods and rest periods for international flight and cabin crew. The onus was on the State to identify “informed boundaries” that aimed to address the general fatigue risk for flight operations nationally. At no time have ICAO SARPs identified actual flight and duty hours because it had proven impossible to identify global limits that adequately addressed operational contexts in different regions.While ICAO SARPs apply only to international operations, many States also chose to establish similar flight and duty time limitations for domestic operations. States generally used the same flight and duty limits for helicopter crew as for airline crew. The fallacy of flight and/or duty limitations is that staying within them means that operations are always safe. Buying into this fallacy suggests that scheduling to the limits is enough to manage fatigue-related risks. However, more recent SARP amendments related to prescriptive limits have highlighted the responsibilities of the operator to manage their particular fatigue-related risks within the limits using their SMS processes. And then there was FRMS…. Fatigue Risk Management Systems (FRMS) represent an opportunity for operators to use their resources more efficiently and increase operational flexibility outside the prescriptive limits, whilst maintaining or even improving safety. In implementing an FRMS, the onus shifts to the operator to prove to the State that what they propose to do and how they continue to operate under an FRMS, is safe. In 2011, SARPs enabling FRMS as an alternative means of compliance to prescriptive limitations were developed for aeroplane flight and cabin crew (Annex 6, Part I). At the time of development, it was necessary to address concerns that airline operators would take this as an opportunity to schedule purely for economic benefits at the cost of safety. Therefore, while often referred to as “performance-based” approach, the FRMS SARPs are nevertheless very prescriptive about the necessary elements of an FRMS and require the explicit approval of an operator’s FRMS by the State. Since then, similar FRMS SARPs were made applicable for helicopter flight and cabin crew in 2018 (Annex 6, Part III, Section II). But what about air traffic controllers? Despite their obvious impact on flight safety outcomes, ICAO SARPs have never required the hours of work to be limited for air traffic controllers even though some States have had hours of duty limitations for air traffic controllers for many years. This is about to change. Amendments to Annex 11, becoming applicable in 2020, will require that ICAO States establish duty limits and specify certain scheduling practices for air traffic controllers. As for international airline and helicopter operations, States will have the option of establishing FRMS regulations for air traffic service providers. the operational context and the safety risk that a fatigue-impaired individual represents in that context. States continue to be obliged to have flight and duty time limitations but are under no obligation to establish FRMS regulations. Where FRMS regulations are established, the operator/service provider, can manage none, some or all of its operations under an FRMS, once approved to do so. Prescriptive fatigue management regulations now provide the baseline, in terms of safety equivalence, from which an FRMS is assessed. In Airlines: The Fatigue Management amendments to the Annex 6, Part I, in 2011 led many States to reviewing their prescriptive limitation regulations for pilots based on scientific principles and knowledge (refer text box) and identifying further requirements for operators to manage their fatigue-related risks within the prescribed limits. Fewer States have reviewed their prescriptive limitation regulations for cabin crew. In every case, despite a refocus on providing adequate opportunities for sleep and recovery, altering existing flight and duty limitations remains a very sensitive and difficult task because it impacts income and work conditions as well as the constraints of pre-existing employment agreements. It is made even more challenging for States whose flight and duty time limitations are legislated. Where States have reviewed their prescribed flight and duty limits, the increased awareness of the relationship between sleep and performance has served to highlight the responsibilities of the individual crew member and the airline to manage fatigue, and in some cases have resulted in the prescribed limits sitting alongside a set of regulations that make these responsibilities more explicit, e.g. the FAA’s Fatigue Risk Management Program, EASA’s Fatigue Management requirements, CASA’s Fatigue Management requirements and CAA South Africa’s Fatigue Management Program. The circadian body-clock affects the timing and quality of sleep and produces daily highs and lows in performance on various tasks. Workload can contribute to an individual’s level of fatigue. Low workload may unmask physiological sleepiness while high workload may exceed the capacity of a fatigued individual. Many States have established, or plan to establish, FRMS regulations, often at the encouragement of their airlines. The FRMS challenge for States continues to be whether they have the resources to provide the necessary oversight from a scientific and performance-based perspective, particularly when the same regulations usually apply to a variety of domestic flight operations. While FRMS requirements are onerous and time-consuming, the few airlines who have so far managed to get FRMS approval for particular routes have found the operational flexibility gained to be worth the effort. The perfect schedule for the human body is daytime duties with unrestricted sleep at night. Anything else is a compromise. The circadian body clock does not adapt fully to altered schedules such as night work. Whenever a duty period overlaps a crew member’s usual sleep time, it can be expected to restrict sleep. Examples include early duty start times, late duty end times, and night work. The more that a duty period overlaps a crew member’s usual sleep time, the less sleep the crew member is likely to obtain. Working right through the usual nighttime sleep period is the worst case scenario. Night duty also requires working through the time in the circadian body clock cycle when self-rated fatigue and mood are worst and additional effort is required to maintain alertness and performance. The longer a crew member is awake, the worse their alertness and performance become. Across consecutive duties with restricted sleep, crew members will accumulate a sleep debt and fatigue-related impairment will increase. 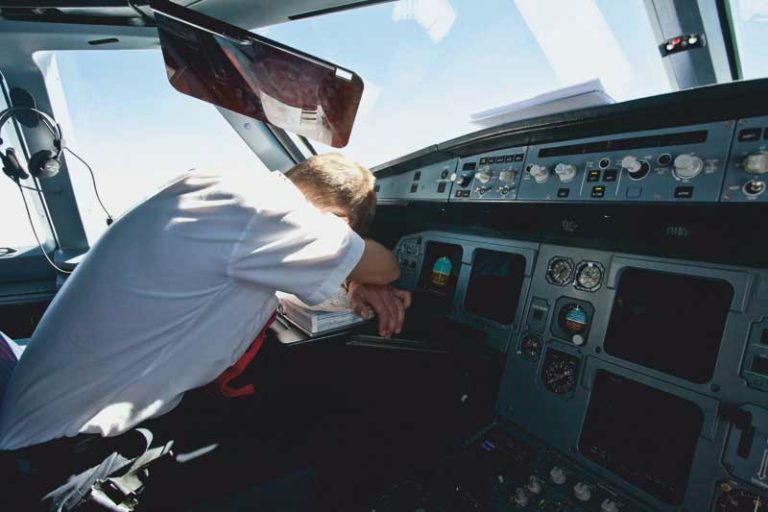 To recover from sleep debt, crew members need a minimum of two full nights of sleep in a row. The frequency of recovery breaks should be related to the rate of accumulation of sleep debt. Keep short notice changes to a minimum, especially where they infringe or overlap the Window of Circadian Low (WOCL). Duty periods associated with high workload (such as multiple, challenging landings and in marginal weather conditions) may need to be shortened and extensions avoided where at all possible. In Helicopter Operations: For some States, the recent amendments to Annex 6, Part II (Section II) have highlighted the need to establish flight and duty time limits for helicopter crew members that better relate to the context of helicopter operations, rather than using the same limits as for airline pilots. Within those limits, the helicopter operator is expected to build crew schedules that use both fatigue science and operational knowledge and experience. A new fatigue management guide for helicopter operators, currently under development in ICAO, identifies general scheduling principles based on fatigue science to guide helicopter operators in building “fatigue-aware” schedules that offer optimum opportunities for sleep and recovery (refer text box). The particular challenge in helicopter operations, however, is that so many helicopter operations are unscheduled. While some helicopter operators will be able to operate within prescribed limits and effectively manage fatigue risks using an SMS, many types of helicopter operations, such as those that require unscheduled, immediate responses, possibly in high-risk settings, will benefit from the operational flexibility and safety gains of an FRMS. In Air Traffic Control Services: Next year, States are expected to have established prescriptive work hour limits for air traffic controllers, while FRMS regulations remain optional and can be established at any time. However, the nature of the relationship between the Air Navigation Services Provider (ANSP) and the State will influence how the implementation of fatigue management regulations will unfold. In most cases, the State provides oversight of only one ANSP and although there is a current trend for privatisation, many of the ANSPs are fully or partially owned by the State. In an industry sector that is often largely self-regulated, the distinction between a prescriptive fatigue management approach and FRMS may become blurred. However, a refocus on safety and not only organisational expediency or personal preference is likely to have substantial effects on the way controllers’ work schedules are built in ANSPs across the world. This is a “watch this space”. The Fatigue Management Guide for Helicopter Operators (1st Edition) is expected to be available later this year. The author, Dr. Michelle Millar, is the Technical Officer (Human Factors) and the NGAP Program Manager at ICAO. She heads the ICAO FRMS Task Force and has been involved in the development of ICAO fatigue management provisions since 2009. Her academic background is in sleep, fatigue and performance.